That bag is so amazing! Love the shape and the rich emerald tone! Such a pity I am late for the giveaway :(. huhuhuhuh! crying right now I missed the entry for this gorgeous bag! Who won? :( love the bag so much! 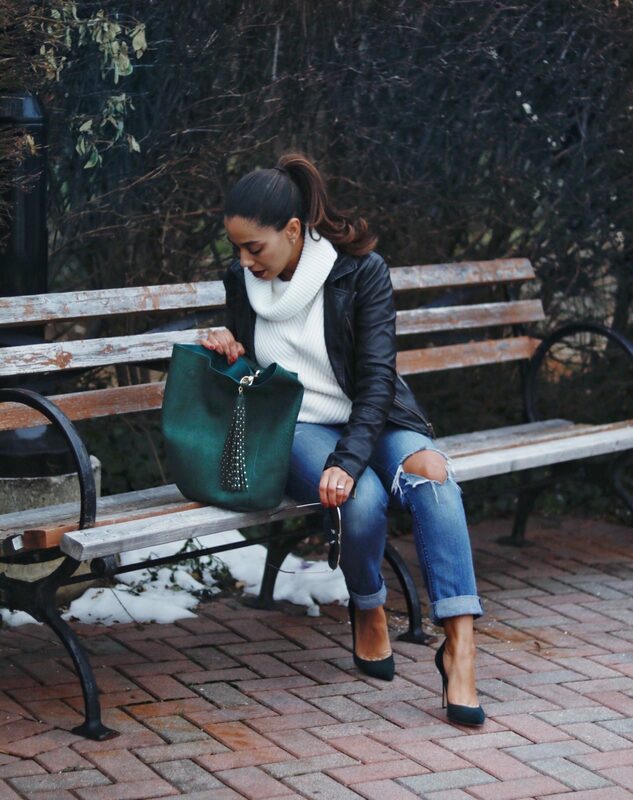 Such an amazing giveaway with a gorgeous bag! Darn, I wish I knew early. I would of definitely entered! Can’t wait for your next giveaway! That bag is so stunning! Love the emerald green shade of it! What a lovely giveaway for the holiday season! Also your outfit is so gorgeous! Love these jeans so much! I love Deux Lux bags! They’re seriously the best. Especially loving this color! Dang it! I’m one step too late for the contest! Such a beautiful bag though. 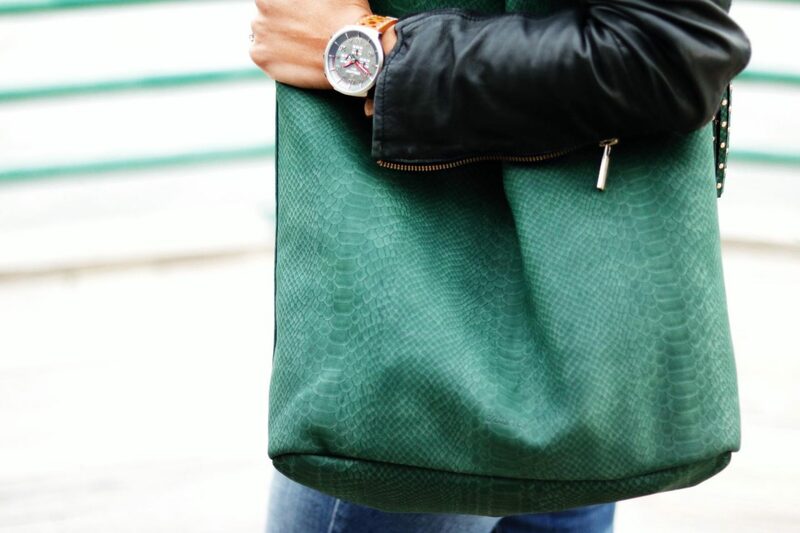 It matched perfectly with your outfit and I love the embossed leather as well! Hope you had a wonderful Christmas! 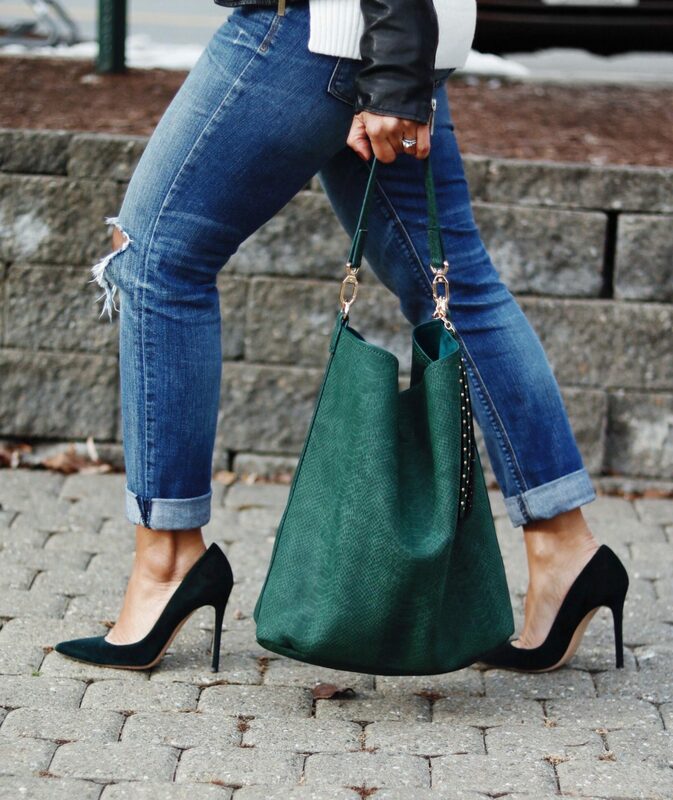 I love how you styled this with that beautiful green bag and the shoes! 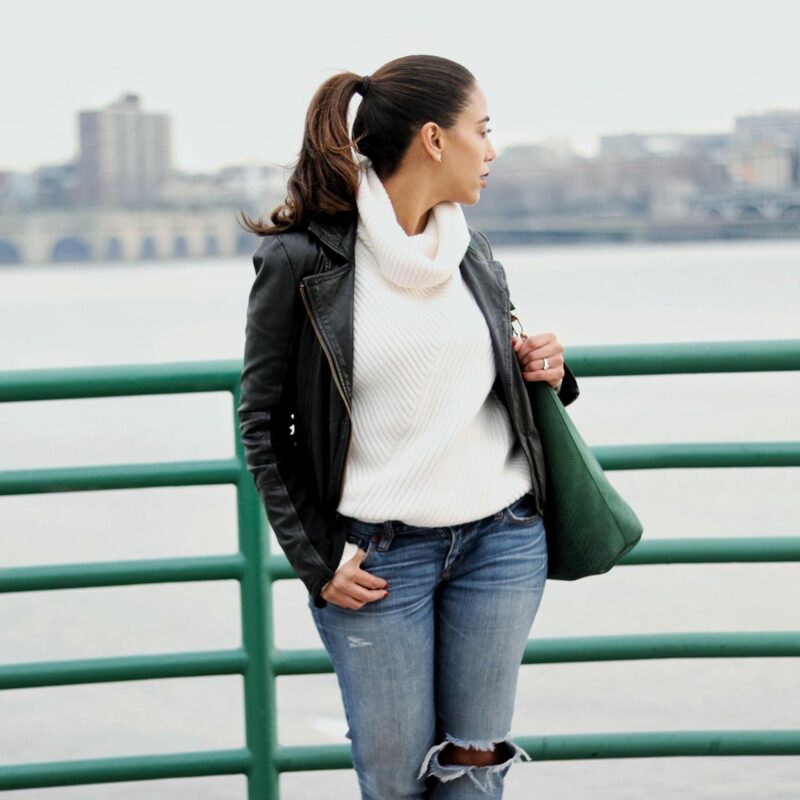 The shoes are to die for but this whole look is so very fall perfect. And it’s awesome that you’re doing a giveaway too! Hope you enjoy your weekend btw ! I love giving gifts!!! And being with my family over the holidays! I love how excited kids get for Christmas. I love being with my family! That’s my favorite part about the holidays! This bag is stunning!! My favorite parts of the holidays are no work(! ), quality time with the kiddos and getting together with our extended family for food and fun! I love everything about the holidays, however being surrounded by family (immediate and then those we don’t get to see as often) and just being actually together is probably my top fave. However, right behind that one would be seeing the innocence/excitement kids display around any holiday, the food, the decorations that seem to tie every holiday to being what it is, and the the uplifting spirits they bring to all. 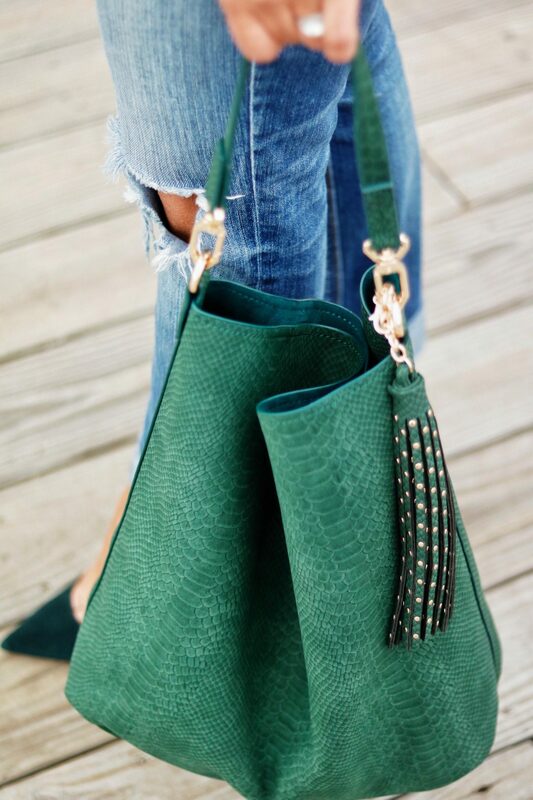 Thank you for such a wonderful opportunity as this bag is exquisite and GREEN (my fave). Hope you and your family have a wonderful holiday! I need this bag in my life!!! Your entire outfit is FIERCE! Well can I list all of the things I love about the holidays on here, lol. I honestly love spending time with family (and not just immediate those we don’t always get to see often as well), to see everyone come together with such love and pure joy is what truly makes the holidays, the holidays. This bag is absolutely stunning and it is so so so generous to offer so many amazing giveaway opportunities. Happy Holidays to you and your family! What I love about the holidays is being able to spend time with my family!! And no homework. (College is exhausting…) That bag is soooo beautiful!! !